Here is the video on how to create this card…Snowflake Video (https://youtu.be/uq-KPp3TaYY). And if you want to learn in real life it will be available during the next Card Class. It’s Technique Tuesday! Today we are stretching our supplies and thinking creatively. The Rooted In Nature set keeps giving me more ideas. Yes, they are beautiful leaves. But, did you know, that those same leaves become beautiful flowers? To see this card finished and several others please tune back in to my Faceboook Page tomorrow night at 7 pm. 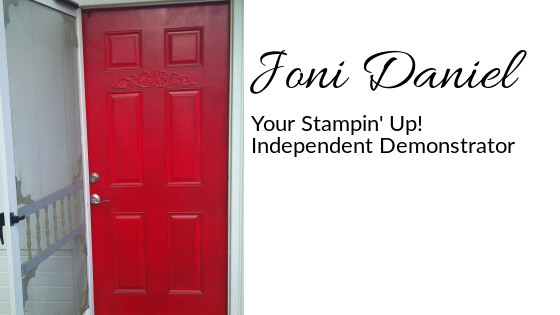 If you don’t have Facebook please check out my YouTube channel “stamping with joni”. The video from the Live will be downloaded and ready for you on Thursday. It’s Tutorial Thursday! Here’s a quick idea for you when you get in a rush for those thirty school treats that need to be done the night before. I know it’s crazy but we are back in session and rolling. My brain is still rebelling against the whole routine but I know I have to get back in the groove of homework, marching band, wrestling, jazz, fundraisers, concerts, and more. It’s painful but we can do it. So, here’s the picture of these cute treat holders. And the video link is https://youtu.be/0vB6QPBRzbA. So, do you hear John Denver? Every time I hear or say Country Lane Suite I think of that song. You know which one. The one stuck in your head now. Last night I created with this great new suite called Country Lane. I love the colors, textures, and images. Now I have to figure out how to bring the cotton to life. I think that’s next week’s project. But for this week, enjoy the texture and layers that come with this card. Here’s the video link on how to create this card…https://www.youtube.com/watch?v=EgkMYn2Y9Ek. And, as promised, here’s the finished card from Tuesday’s technique. When the littlest piece is the most important. Sometimes the littlest piece is the most important. In this case that little scrap from yesterday’s post became the anchor point to tie on the wire accent or ornament. To view the video and how to create this card as well as a preview of new products for the Holiday Catalog please go to https://www.youtube.com/watch?v=-Ujp4ofA6vo. All right…drum roll please…here is the tutorial you have been waiting for. It will be long but it will be worth it. At the end of it all you will be able to create a wreath card with a single stamp and a sentiment. Are you ready? Let’s go! Cut a piece of Thick Very Vanilla Cardstock in half (5 1/2 x 8 1/2″) and score at 4 1/4″. This is your card base. Cut a piece of Old Olive Cardstock to measure 5 x 3 3/4″. Cut a piece of Merry Merlot Cardstock to measure 4 1/2 x 3 1/4″. Cut a piece of Very Vanilla Cardstock to measure 6 x 6″. The Old Olive and Merry Merlot pieces are your mats. You can glue to your card base now if you like. Take your 6 x 6 piece and the largest square die from the Layering Squares Framelits. Cut out a square in the middle and then a diamond. Now place your square inside the template (after writing save and an arrow up) on the base of the Stamparatus. Place your stamp on the square where you want it to stamp. Press the hinged, clear plate on to the stamp to pull off the page. Ink your stamp with Old Olive and stamp. Rotate your square either counter-clockwise or clockwise. Whichever way you decide you need to be consistent with. Now place in the diamond template and rotate until all is filled. Take your sentiment and stamp in Merry Merlot with the Stamparatus. Place embellishments accordingly. The faceted gems were used here. Here is the finished card. Enjoy!